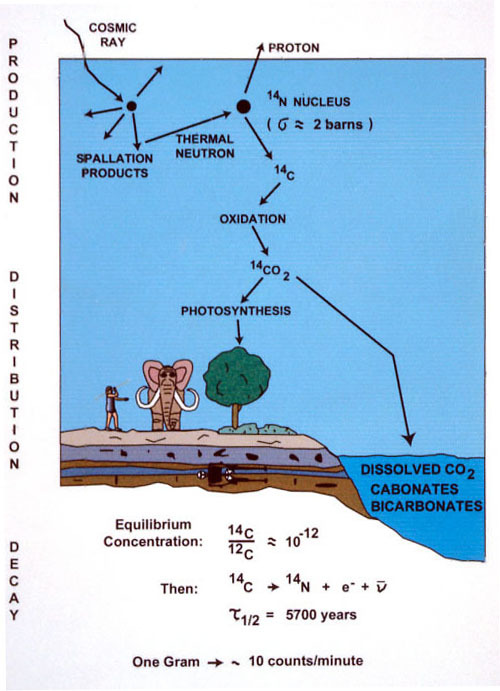 Diagram of production of carbon-14 in the upper atmosphere by reaction of neutrons with nitrogen, and of the subsequent incorporation of carbon-14 into the biosphere. Having been called a liar by a creationist for saying there were no scientifically valid examples of 14C dating of dinosaur fossils, and then, despite his claim that there were 'lots' of them, being treated to him prevaricating and deflecting for several days before failing to provide any such examples even after numerous requests, I decided I would look closer at this claim. First a brief background. For more detail see this article by A. J. T. Jull, a research scientist at the NSF Arizona AMS Facility and Department of Geosciences, University of Arizona, in Tucson, Arizona, USA. Carbon-14 (14C) dating is, when done correctly on carefully decontaminated specimens, an accurate method of dating an organic specimen within well-known limits of confidence and within a well-defined date range. The date obtained will always be expressed as x years BP ± y years. Doing it correctly not only means careful decontamination but also understanding its limitations, the major one being the date range over which it is reliable, why this limit exists and, importantly, exactly what carbon you are measuring in the sample and how it got there. Not all carbon is organic in origin and not all carbon in archaeological samples is derived from the original organic carbon. For example, although carbonates may be present in the mineralised bones of which fossils are made, this does not mean it came from the original bone. After all, fossils will contain large amounts of silicates but bone does not normally contain silicon. The minerals in fossils are replacements for the original material, not necessarily the products of it. The isotope of carbon, 14C, is present in the atmosphere at a more or less constant rate (but see below), being produced by the action of cosmic rays on nitrogen in the atmosphere. Normal carbon is 12C but, apart from being slightly heavier, 14C is identical chemically to 12C. 14C 'decays' at a constant statistical rate so that over a given period a known proportion of the 14C will have 'decayed' to 12C. By comparing the predicted amount of 14C in tree rings (dendrochronology) it is possible to estimate how the production of 14C in the upper atmosphere changes over time due to variations in solar radiation and changes in Earth's magnetic field, so results can be corrected with these known variations. When 14C becomes incorporated into an organic molecule it becomes fixed in that molecule and so, unlike in the general background in which the amount of 14C remains constant, the amount of 14C in a sample of organic matter will fall over time. The known 'half-life' of 14C is 5730 years so that, in 5730 years, half the 14C will have decayed to 12C. So, by measuring the amount of 14C in a sample and comparing it to the amount of 12C, it is simply a matter of mathematics to calculate how long it has been decaying for and so the age at which the original organic molecule was manufactured. However, the proportion of 14C to 12C in the general background is very small to begin with, being only about one atom in one trillion. This means that a reasonably large sample is needed to begin with and, more importantly, it doesn't take long, no matter how large the sample, for the number of 14C atoms to become too small to be significant. As the number of 14C atoms present falls so the confidence in the measurement decreases until the range becomes so large as to make the calculated age almost meaningless. For this reason, 14C dating is only useful up to about 50,000 years and decreasingly so as that age approaches. It also means that any contamination, especially from recent sources, can have a profound effect on the result making any sample appear to be much younger than it is. For this reason, 14C dating is normally repeated several times and preferably by two or more independent laboratories. It is also verified by other dating techniques and 'corrected' for known changes in 14C production. It also means that care must be taken that the carbon being measured is actually the carbon that was present when the organic matter was made. For this reason, it is not used to date mineralised fossils. The process of fossilisation replaces the original organic matter with minerals, some of which may contain carbon, but carbon derived not from the fossil but from the environment, and this process can take place over a very long period and the resulting minerals will always be in dynamic equilibrium with their environment. So what has this to do with Hugh Miller and creationist lies? Very simply, Hugh Miller famously claims to have obtained a 14C date on some fragments of triceratops fossils and found them to be less than 40,000 years old, making them contemporaneous with modern humans. For some reason, creationists seem obsessed with dinosaurs and especially with proving that they lived with humans. They seem to be acutely aware that the existence of such large animals tens of millions of years ago, and their difficulty explaining how they fitted on the Ark, undermines creationism. This problem for creationism is particularly acute in children who seem to be especially fascinated with dinosaurs just at the impressionable age when creationists need to be selling them Bible literalism, before they develop the necessary knowledge and scepticism to reject it. So, isn't this 14C dating of triceratops something of a problem for evolutionary biology and mighty blow for creationism? Just as the Paluxy human and dinosaur tracks hoax was atrophying in it's effectiveness as a propaganda tool because maintaining that it wasn't a hoax was making creationists look even more ridiculous, didn't the astonishing 14C date fill just that gap? Well, yes, that was a fortuitous conincidence, wasn't it! In fact, it was just a little too handy. It was an even more elaborate hoax than the Paluxy hoax. Bear in mind that Hugh Miller is a leading member of the Creation Research, Science Education Foundation (CRSEF). I'll let Bradley T. Lepper explain in his National Center for Science Education, article, "Radiocarbon Dates for Dinosaur Bones?" (pdf). Bradley Lepper is the Curator and Site Archaeologist for the Ohio Historical Society's Newark Earthworks and Flint Ridge State Memorials. He also is a Visiting Professor in Sociology and Anthropology at Denison University. The Creation Research, Science Education Foundation (CRSEF) of Columbus, Ohio announced recently that several radiocarbon dates had been obtained on dinosaur bones which proved that "dinosaurs lived with man .. . as recently as 10,000 years ago" (Lafferty 1991:2A). The claim that dinosaurs co-existed with humans is a popular creationist notion supported by alleged human footprints found in rocks alongside fossilized dinosaur footprints (see Cole and Godfrey 1985 and Kuban 1989a and 1989b for an extensive discussion of this topic), prehistoric petroglyphs which creationists interpret as depictions of dinosaurs (Dahmeretal. 1990:372; Fields etal. 1990), and a few surprisingly recent radiocarbon dates obtained for apparent charcoal or carbonized wood supposedly associated with dinosaur bones (Bierle and Fields 1979; Morris 1984). The Creation Research, Science Education Foundation (CRSEF) is a non-profit, tax exempt corporation founded in Millersburg, Ohio in 1972 "to advance knowledge of the scientific evidences against evolution in schools and among the general public" (CRSEF n.d.). In addition to their search for traces of people and dinosaurs in the Cretaceous limestone of the Paluxy River area of Texas CRSEF researchers also are looking for Noah's Ark on Mt. Ararat in Turkey (CRSEF n.d.). CRSEF obtained several fragments of fossilized dinosaur bone from the paleontological collections of the Carnegie Museum of Natural History "by disguising the nature of the creationist science group" (Lafferty 1991:2B) and by misrepresenting the nature of their proposed research. James King, Director of the Carnegie Museum, says Hugh Miller and his party identified themselves as chemists who wanted to do some analyses of the chemical composition of the fossils. King says that small "bits and pieces" which had spalled off the surfaces of various specimens were offered to Miller with the explicit warning that the fossil bones had been "covered heavily in shellac" and other "unknown preservatives." Miller accepted the fragments and indicated that the coatings posed no problems for the analyses they were considering. Subsequently, several of the bone fragments were submitted to the University of Arizona's Laboratory of Isotope Geochemistry for radiocarbon dating. CRSEF "also arranged the Arizona testing by not revealing its origins" (Lafferty 1991:2B). Austin Long, professor of geochemistry at the University of Arizona, informed Miller that there was no collagen (a protein which is the source of most of the carbon in bones) in the samples and that large amounts of shellac and other contaminants were present. Miller indicated that he wanted the samples dated regardless. CRSEF's misrepresention of their intentions, although ethically questionable, may have been necessary in order for them to obtain the specimens they required. No responsible curator would have approved of sacrificing valuable dinosaur fossils for unsuitable tests. Radiocarbon dating techniques cannot date samples which are older than about 50,000 years. There simply is not enough carbon 14 remaining in the sample to measure reliably. It is a firmly established geological fact that dinosaurs lived between 248 and 65 million years ago. Indeed, the age of the rock layers which contained the fossil specimens CRSEF obtained from the Carnegie Museum has been established by numerous independent dating methods. These age determinations range from 130 to 150 million years before the present (Kowallis et al. 1991). Therefore, these fossils are outside the range of radiocarbon dating methods. Clearly then, Hugh Miller knew the samples were contaminated and knew that whatever carbon was being tested was not that of the original dinosaur, yet went ahead and tried to present this falsified data to the Western Geophysics Meeting in Singapore in August 2012. He then, in true creationist style, played the martyr and claimed bias when his abstracts were removed from the proceedings report on the basis that the data was erroneous. Creationists now claim the data was dismissed by 'evolutionists' without being examined because it didn't match their preconceptions. The truth is that 14C dating had been inappropriately used on contaminated samples from dinosaur fossils for which dates had been independently determined, not by dating the fossils themselves but the geological strata in which they were found. The organic matter (collagen) and hard carbonate bone mineral (bioapatite) in the bone samples were analyzed. The samples came from several species of dinosaurs (acrocanthosaur, hadrosaurus, triceratops and apatosaurus) taken from various sites in Texas, Colorado, Arkansas and Montana. The samples were meticulously handled and cleaned to avoid possible contamination. The carbon-14 (C-14) levels in these samples were measured using Accelerator Mass Spectrometry (AMS). The resultant C-14 ages obtained from these samples were consistently in the 22,000 - 39,000 years range. The fact that the samples were from a variety of species and sites all giving consistent results greatly reduces the chance that the results are from contamination. Clarke, J. DINOSAUR BONES "BURIED" BY EVOLUTIONISTS! This claim despite the evidence from Austin Long that he told Miller there was no collagen in the sample and despite the evidence from James King that he told Miller the samples were heavily contaminated with shellac and other preservatives. Like the Paluxy hoax, the 14C in dinosaur 'bone' is a hoax intended to mislead - a hoax perpetrated by an organisation that benefits from its tax-exempt status as an 'educational' institute. There are no authenticated examples of 14C being found in dinosaur bone and no serious palaeontologist would claim to have dated a fossil with it. You can be as sure as it's possible to be that any creationist who claims otherwise it either lying or has been fooled by liars. Being a devout Christian creationist, and having been shown to be wrong, did my accuser withdraw his claim and apologise? Of course not! Don't expect intellectual honesty from a theist. Dogma by definition won't allow it. William Lane Craig even said that if he was taken back in a time machine and saw for himself that Jesus did not resurrect, he would still believe that it happened anyway. Center for Applied Isotope Studies at the University of GA. The resultant age 33,570 years before present. I wonder why this kind of information is suppressed/omitted. Evidently you didn't bother to read the article you are commenting on, since that claim is dealt with in it. It is not suppressed or ignored but is often referred to as an example of a creationist fraud. Do you know who lied to you and told it was published in a peer-reviewed journal, or did you just make that bit up? Firstly, a fossil does not contain soft tissue. If might contain fossilised formerly soft tissue such as skin or tendons but that is not the same as soft tissue. Secondly, during the fossilisation process organic carbon is replaced by inorganic carbon, some of which would be atmospheric CO2. In any case, the origi of the carbon being dated would be indeterminate. THis is why fossils are dated by dating the matrix in which they are embedded and by various different methods EXCEPT C14 dating. Anyone stupid enough to use C14 dating on a fossil would not be dating the fossil but the carbon it had been mineralised with. This is why no serious scientist would give any credence to Hugh Miller who claims to have C14 dated a dinosaurs, especially since Hugh Miller is a self-declared creationist who subscribes to the view that no evidence can contradict a literal interpretation of the Bible. I'm amused that C14 dating had suddenly become absolutely reliable, even when misused, whereas it used to be creationist dogma that it was a flawed technique because it keeps on providing data that shows creationism to be a mere primitive superstition with no basis in science. And you appear to have confused two well-know creationist frauds. In all, not a very competent attempt to mislead people, but no worse than the normal creationist performance. Are you serious? YOu have so many facts wrong I don't know where to begin. What happened at the Geophysical Symposium had nothing to do with the fossil form the Smithsonian years ago. Please take this article down or do better research before slandering people. How about you start by telling me what facts I have arong? Or do you just want people to think you could if you wanted to because you want them to believe falsehoods? Unintelligent Design - Silly Goose! Good Old Biblical Slavery - In The USA Today! What A Carry On At The Vatican! Another Gap Closes. No God Found!